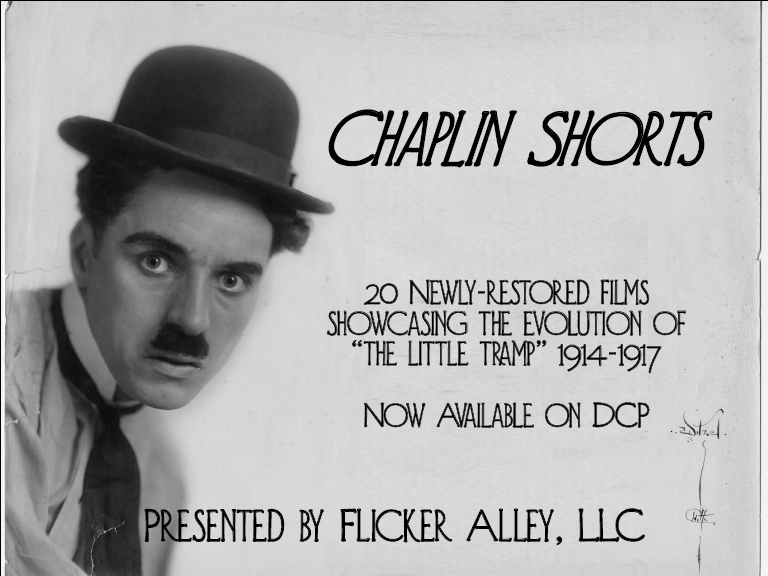 12 Chaplin Mutual films and 8 Keystones are available on DCP from Flicker Alley. 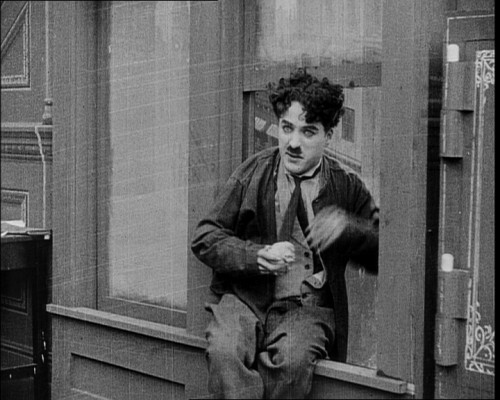 Chaplin’s maturation as an artist is seen in these films, many of which are considered his best works. His inventiveness shines as he stretches himself to take on new characters. 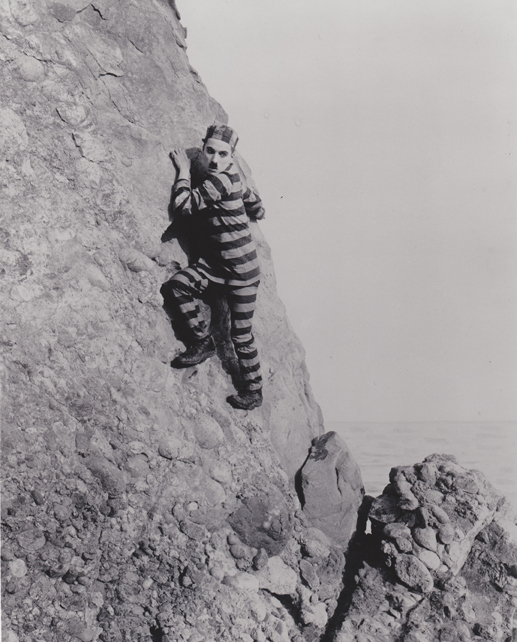 In addition to playing his ‘Little Tramp’ character, he portrays a fireman, a police officer, a prisoner, and more. These shorts make an excellent program on their own or as a companion piece to the screening of a full-length film. 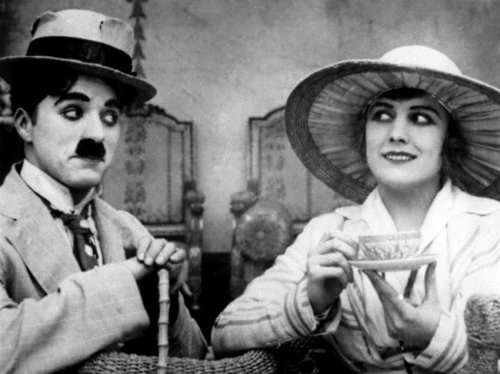 For more information about renting the Chaplin Shorts DCP for your theater, please fill out the Request Screening form or click the button below. THE IMMIGRANT – 24 min. The ‘Tramp’ as an immigrant coming to the United States who is accused of theft on the voyage across the Atlantic Ocean and befriends a young woman along the way. Also starring Edna Purviance and Eric Campbell. THE ADVENTURER – 25 min. Chaplin plays an escaped convict on the run from prison guards. He falls into favor with a wealthy family after he saves a young lady (Edna Purviance) from drowning, but her suitor (Eric Campbell) does everything he can to have Chaplin apprehended by the officials. It is the last of the twelve films made under contract for the Mutual Film Corporation. THE CURE – 25 min. 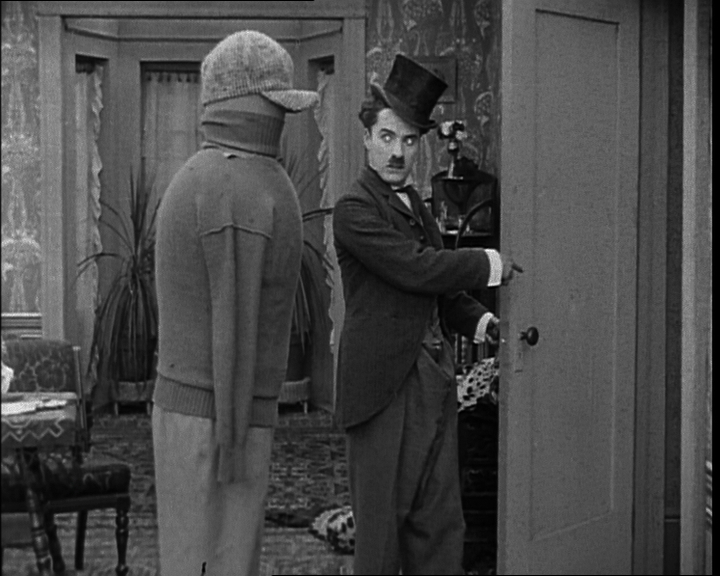 Chaplin plays an alcoholic who checks into a health spa to dry out, but brings along a big suitcase full of alcohol. The hotel employees imbibe his liquor and their raucous antics anger the hotel owner. Meanwhile, a young woman inspires Chaplin to get sober, but little does he know the spa’s waters have been contaminated by his alcohol. EASY STREET – 26 min. 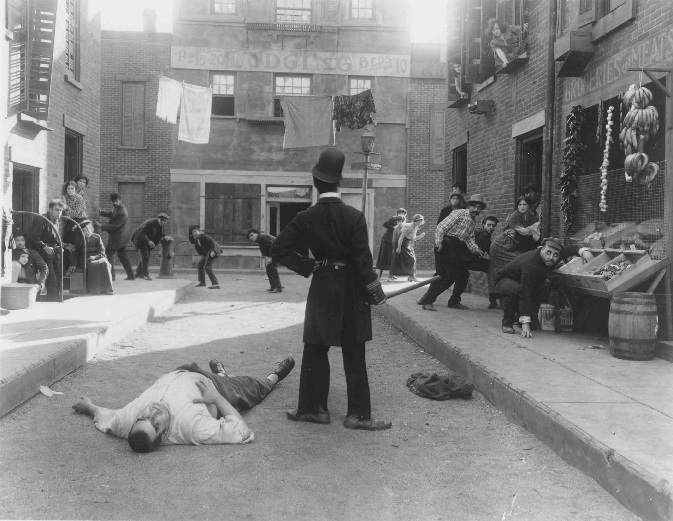 In a slum called “Easy Street”, the police are failing to maintain law and order and so the Little Tramp steps forward (rather reluctantly) to rid the street of bullies, help the poor, save women from madmen. KID AUTO RACES IN VENICE – 6 min. The first appearance of Chaplin’s ‘Little Tramp’ character. Chaplin plays a spectator at a ‘baby-cart race’ in Venice, Los Angeles. The spectator keeps getting in the way of the camera and interferes with the race, causing great frustration to the public and participants. THE ROUNDERS – 13 min. 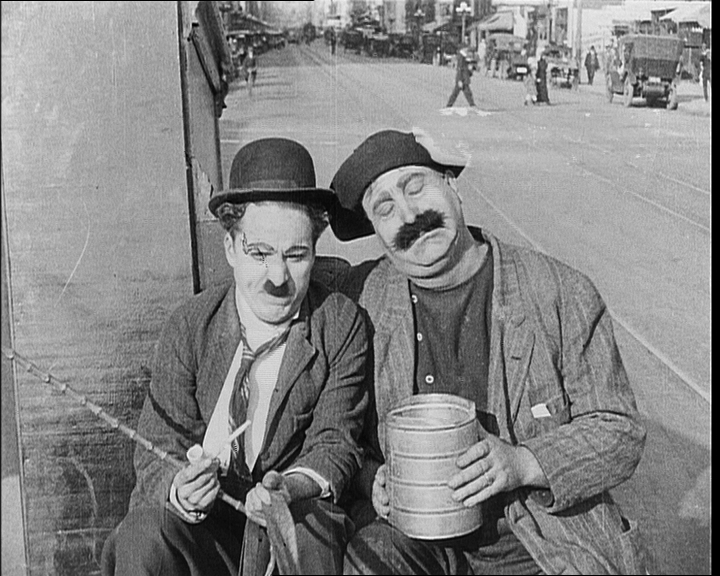 Chaplin and Roscoe “Fatty” Arbuckle play two drunken revelers fight with their wives then go out on the town to get even drunker. When their wives catch up to them at the bar, the men make their escape and flee in a rowboat. Tired, the pair falls asleep as the boat sinks into the water. DOUGH AND DYNAMITE – 28 min. 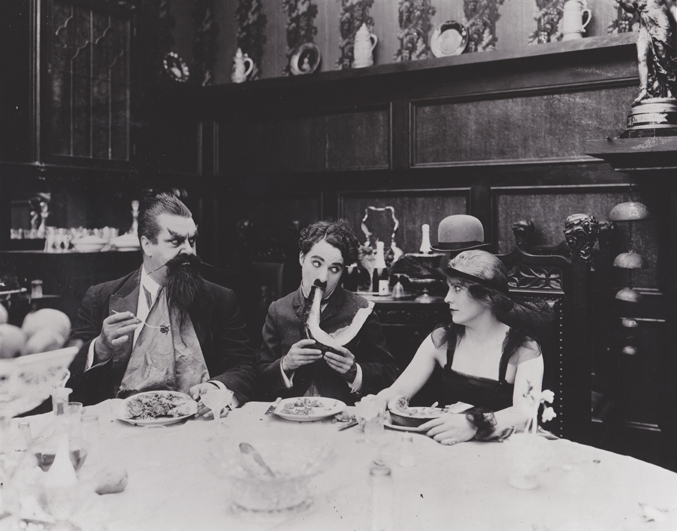 Chaplin and Chester Conklin work as waiters at a restaurant where the cooks go on strike. When the two are forced to work as bakers, the striking cooks put dynamite in the dough, with explosive results. MABEL’S MARRIED LIFE – 14 min. At the park, a man put the moves on the the ‘Tramp’s wife, Mabel. The ‘Tramp’ tracks down the intruding man’s wife, and a fight breaks out among the two couples. On the way home, Mabel buys a man-shaped punching bag while the ‘Tramp’ goes to a bar. When he returns home, he drunkenly mistakes the punching bag for a male rival and tries to challenge the punching bag to a fistfight. Co-written and starring Mabel Normand. THE MASQUERADER – 12 min. 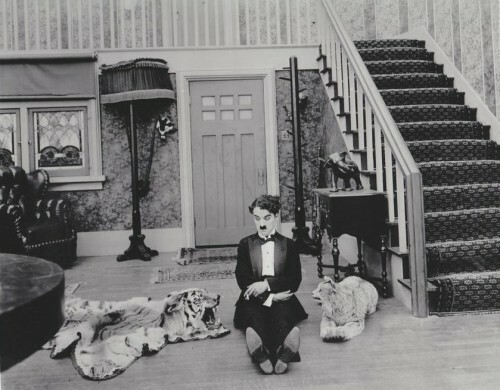 Chaplin plays an actor who bungles several scenes and is kicked out. He returns convincingly dressed as a lady and charms the director, but never makes it into the film. Also starring Roscoe “Fatty” Arbuckle. THE NEW JANITOR – 12 min. The hero, a janitor played by Chaplin, is fired from work for accidentally knocking his bucket of water out the window and onto his boss the chief banker. Meanwhile, one of the junior managers (Dillon) is being threatened with exposure by his bookie for gambling debts unpaid. Thus the manager decides to steal from the company. He is caught in the act of raiding the vault by the bank secretary who rings the downstairs for help. 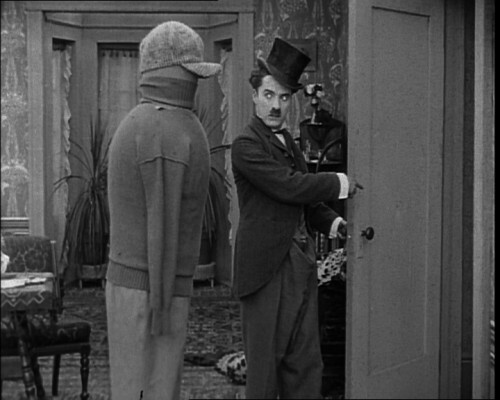 Chaplin comes to the rescue only to be misjudged by the Chief Banker as the thief. The Secretary fingers the manager and Chaplin receives a just reward and a handshake for foiling the robbery. This film served as a precursor to a key Essanay Studios short, The Bank. HIS MUSICAL CAREER – 13 min. Chaplin and his partner Mike work at a piano store, whose manager orders them to deliver a piano to Mr. Rich at 666 Prospect Street and repossess one from Mr. Poor at 999 Prospect Street. Hilarity ensues when they do exactly the opposite after mixing up the addresses of their customers. HIS PREHISTORIC PAST – 22 min. 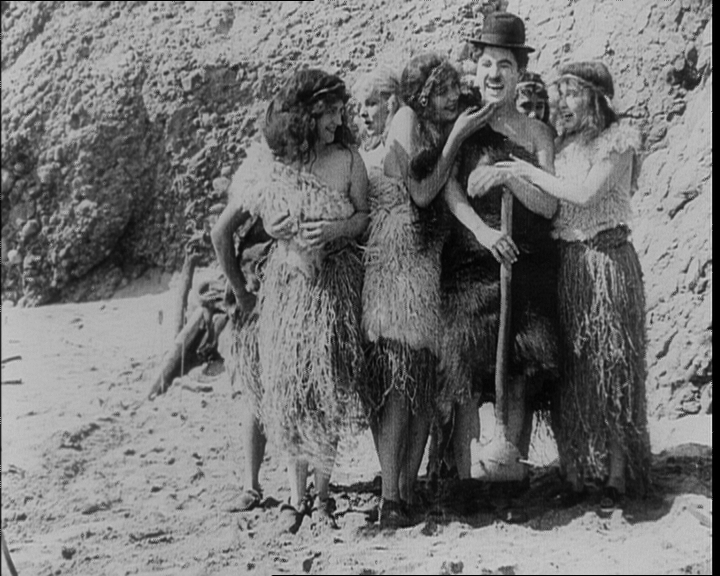 Sets Chaplin in a stone-age kingdom trying to usurp the crown of King Low-Brow to win the affections of the king’s favorite wife. 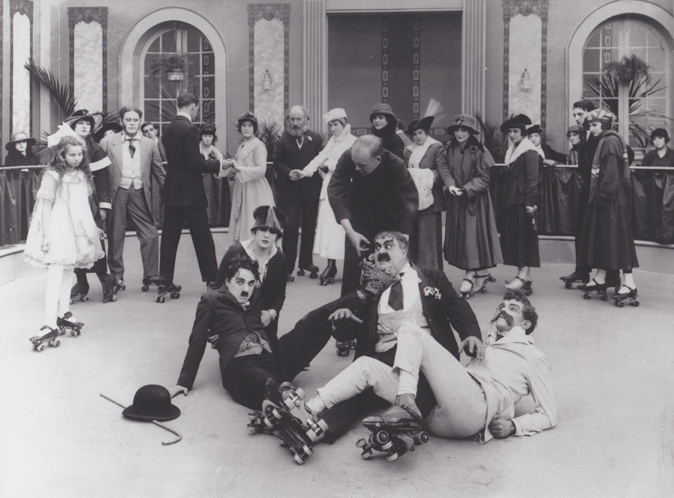 The film was Chaplin’s last at Keystone Studios. ONE A.M. – 18 min. 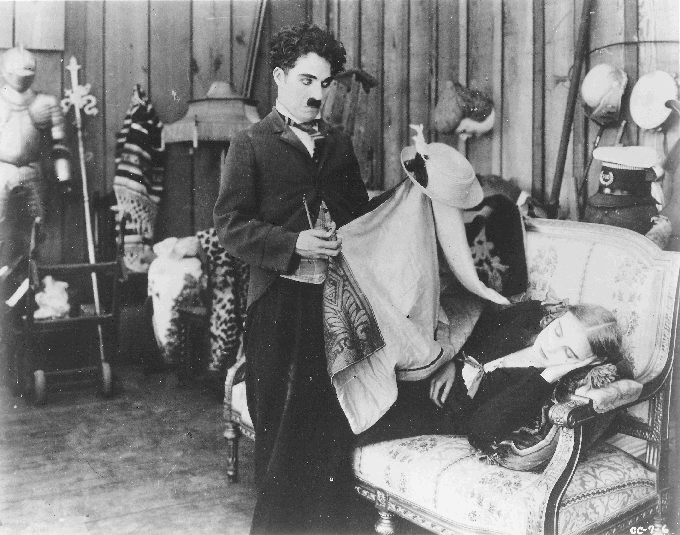 Chaplin plays a rich young man who has trouble navigating his way to bed after returning home from a night on the town. Inside the house, the furniture and other inanimate objects become almost insurmountable obstacles for the drunk. 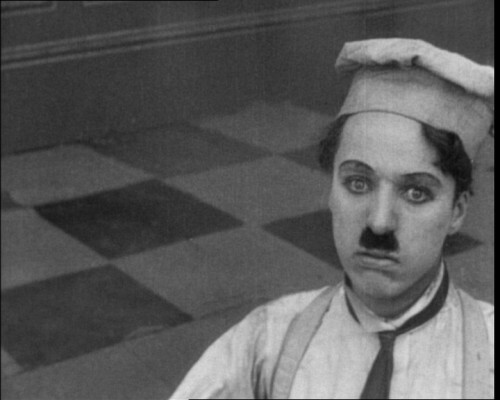 The first film Chaplin starred in alone, except for a brief scene of Albert Austin playing a cab driver. 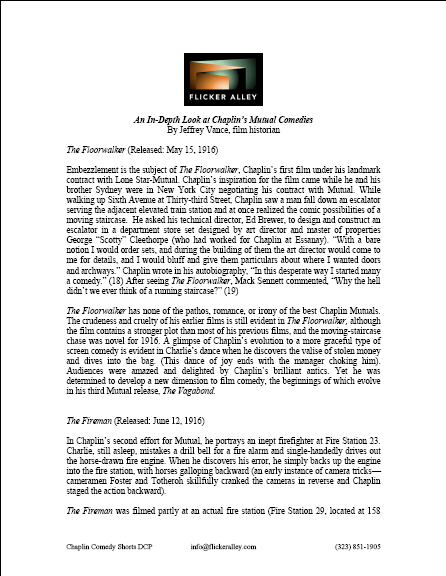 THE FLOORWALKER – 28 min. The ‘Tramp’ is a customer who creates chaos in a department store and becomes inadvertently entangled in the nefarious scheme of the store manager, played by Eric Campbell, and the store’s floorwalker, played by Lloyd Bacon, to embezzle money from the establishment. Chaplin’s first Mutual Film Corporation film. THE RINK – 24 min. After amusements working in a restaurant, Charlie uses his lunch break to go roller skating. Also starring Edna Purviance, Eric Campbell, Henry Bergman, and Albert Austin. THE PAWNSHOP – 25 min. 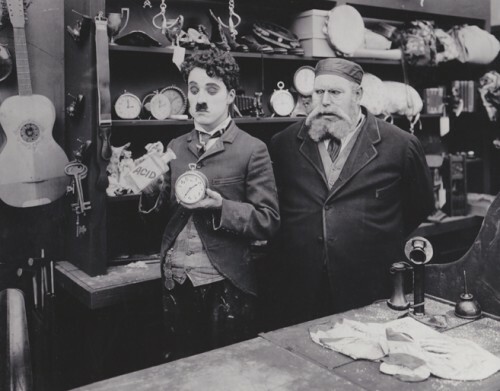 Chaplin plays an assistant in a pawnshop run by Henry Bergman. He engages in a slapstick battles with his fellow pawnshop assistant, deals with eccentric customers, and flirts with the pawnbroker’s daughter, played by Edna Purviance. One customer, posing as a jewelry buyer, pulls a gun and tries to rob the place. 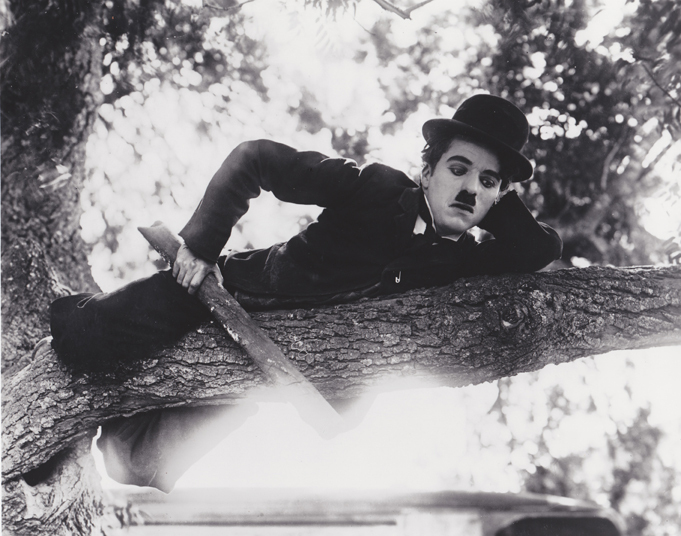 Chaplin disarms him. THE VAGABOND – 25 min. The ‘Tramp’ wanders off into the vicinity of a gypsy caravan. He encounters the beautiful, though bedraggled, Edna (Purviance) and entertains her with his violin. She has been abducted and abused by the gypsies, chief among them Eric Campbell, who whips her mercilessly. Charlie comes to her rescue and knocks her tormentors on the head with a stick, before riding off with her in a commandeered cart. The intimacy which develops between them, as Charlie washes her face in a bowl and combs her hair, is complicated by the arrival of an artist love rival and her parents. Driving off with the latter, Edna suddenly realises that her heart belongs to Charlie and orders the car to reverse and take him along with her. THE FIREMAN – 25 min. A young girl’s father arranges with the local fire chief to have his house burn down so he could collect on the insurance money. However, a real fire breaks out elsewhere in the town. The firemen ignore an inhabitant of the burning building as he tries to alert them to the fire. 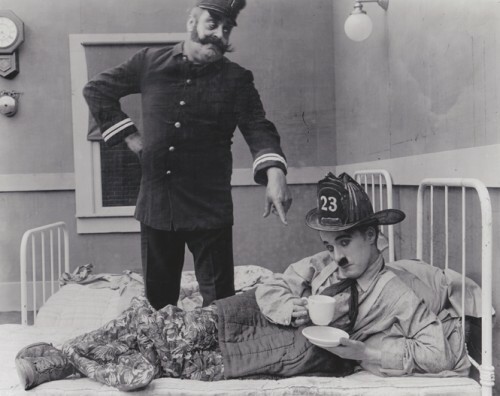 Eventually, a fireman (Chaplin) alerts the fire chief and the fire company goes to put out the fire. The father than realizes that his daughter is still in his own burning building, and the same heroic fireman climbs the outside of the building to save her. THE COUNT – 24 min. 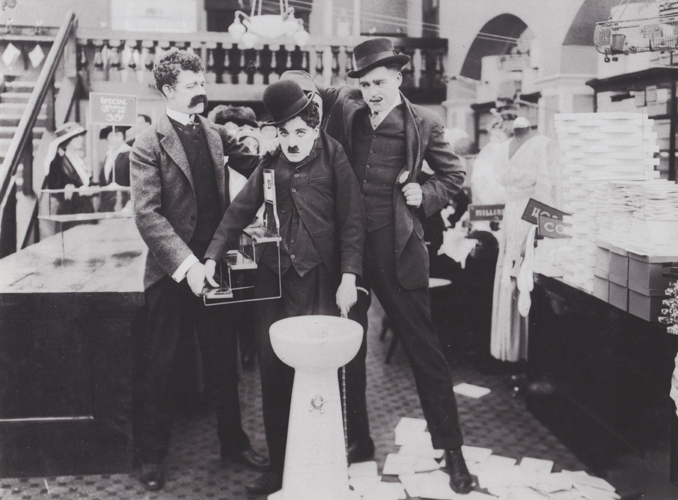 The tailor’s handyman (Chaplin) burns a count’s trousers while ironing them and is fired. His superior discovers a note explaining the count can’t attend a party, and dresses up like one to take his place. 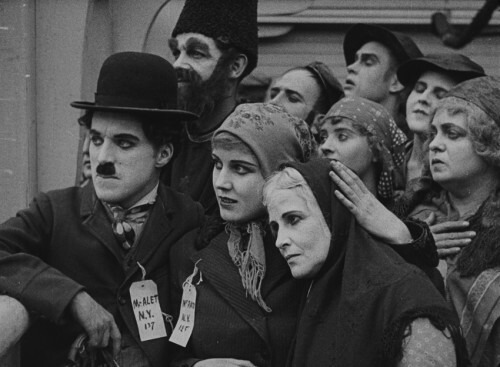 Chaplin also goes to the party. There, he and the tailor fight over the fair maiden, Miss Moneybags (Edna Purviance). Soon, Charlie is distracted by a gypsy girl and the tailor must fend off other suitors. The real Count finally arrives, learns of the imposters and calls the police. Chaplin makes a mad dash through the party and scampers away to safety. BEHIND THE SCREEN – 24 min. The film takes place in a movie studio. A stagehand named David (Chaplin) has a supervisor, Goliath (Eric Campbell). 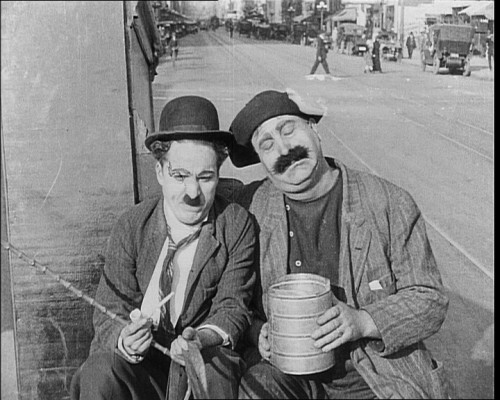 Much of the film is slapstick comedy involving Chaplin manhandling large props, but other plotlines include a strike by the stagehands, and Edna Purviance, who is unable to become an actress, dressing as a man and becoming a stagehand. “Flicker Alley and its collaborators devoted eight years to tracking down prints from international archives to assemble the best versions for digital transfer . . .
Click here to download press kit. Click here to download essays.